Scouting New York, the wonderful site that brought us the Russian Space Church, as well as that mysterious gold bar hidden in a cemetery sewer drain, has done it again. Behold! 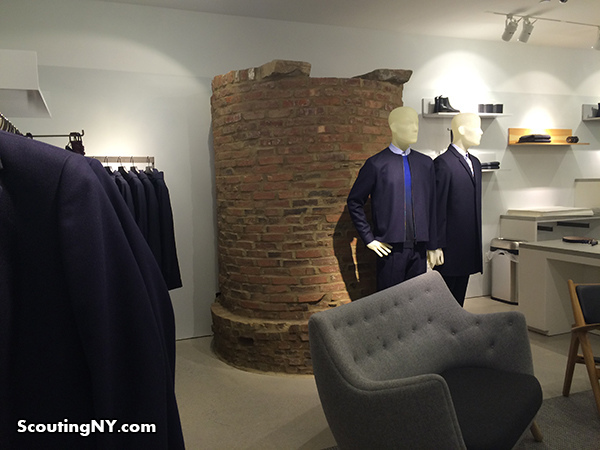 The 200-year-old haunted well not-so-hidden within a SoHo clothing store. “The well-documented story has it that a young woman named Gulielma Elmore Sands left her Greenwich Street boarding home on the evening of Dec. 22, 1799, to meet Levi Weeks, a fellow boarder. The two had a secret romance and were planning to elope that night. Eleven days later, her body was found in a well in Lispenard’s Meadow (today’s Spring Street). Marks on her neck suggested death by strangulation…. Located in the basement of the recently opened “style over fashion” COS clothing store (relative of H&M) at 129 Spring Street in Soho, it’s absolutely wonderful that the renovators opted to keep said death-well, rather than erase it. As Vanishing NY has shown us, magicians are hard at work making invisible the very city we have come to love. And, so, it is a pleasure to know that when it comes to wells used to strangle ol’ timey boarders, some business owners are all about preservation. Categories: ALIENS, GHOSTS, CONSPIRACY, ETC.